Last week, I wrote a blog in which I tried to figure out the 1941 parachute landing site of German spy Karel Richter. 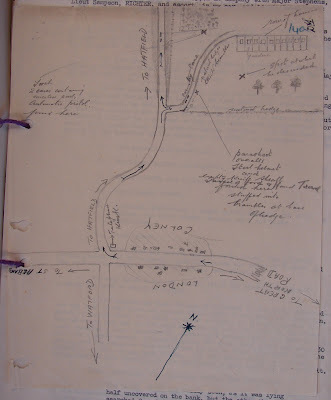 A map drawn by Camp 020 officer, D.B. Stimson, gave some clues but also had its fair share of problems, most notably a mysterious row of houses and an odd North direction. Richter's landing site and equipment stashes. Since then, I've had an email chat with Tony, a researcher/writer who's been working on the story of another spy, Jan Willem Ter Braak a.k.a. Engelbertus Fukken. Tony knows the London Colney area fairly well and his thoughts and comments spurred me to dig a bit deeper. The last time I visited the National Archives, I took photographs of some papers from the MI5 files associated with Karel Richter. 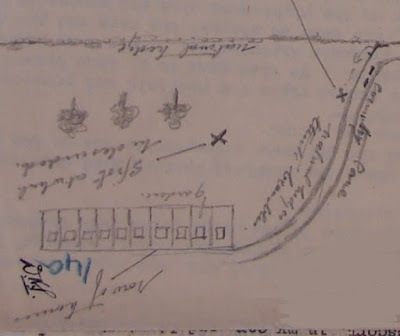 As happy circumstance would have it, one of the images from Richter's trial included a sketch map of his landing site. The sketch map is an order of magnitude better than Stimson's map. 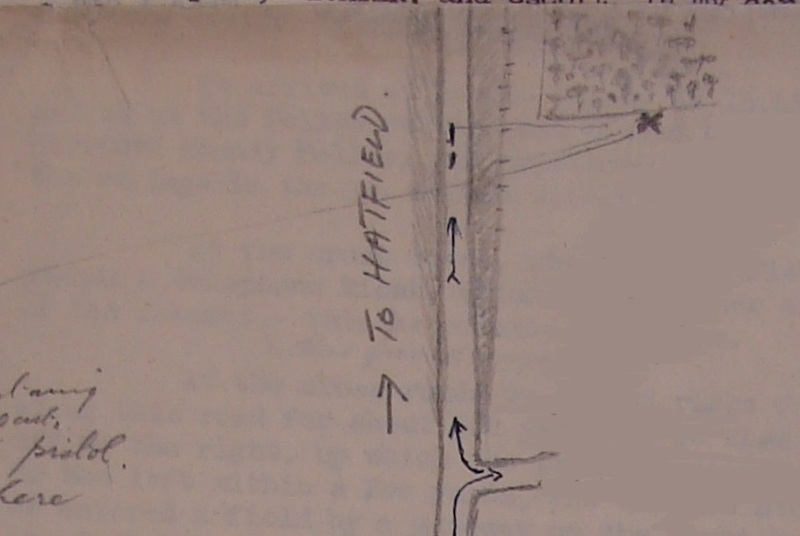 The North direction is relatively accurate and the map clearly shows the country lane near which Richter landed. 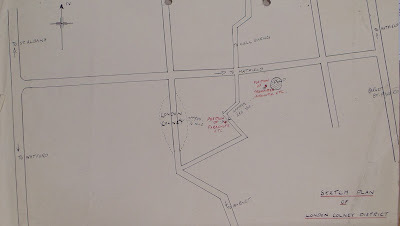 The map also notes the two locations where Richter stashed his gear. 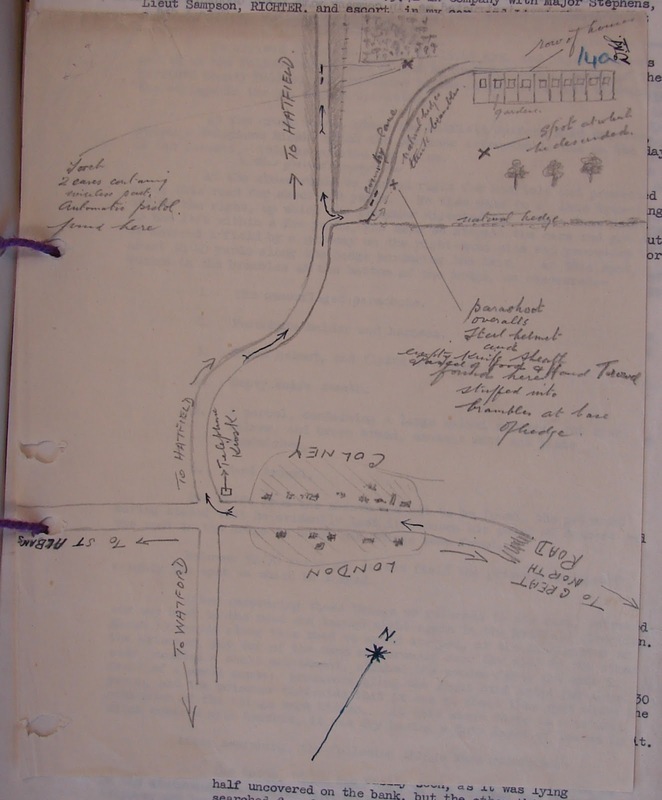 If we take Stimson's map, crop off the highway, reduce the map to just the lane and turn it upside down, we begin to see the rough outlines of the country lane noted on the trial map. Today, this lane is called White Horse Lane. Richter's landing site and equipment stash. White Horse Lane has a distinctive "S" shape and connects the North Orbital Road with the southeastern corner of London Colney. A bit more digging produced a war-era aerial photograph of the area. The two images below are roughly the same scale based on the location of the North Orbital Road and White Horse Lane. 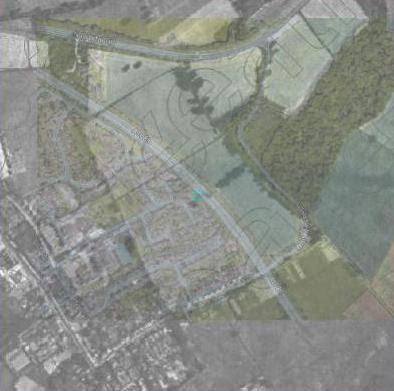 One can clearly see that London Colney has expanded quite a bit over the last 75 years and that the A1081 (the major road bypassing London Colney from lower right to upper left) has drastically reduced the size of the fields. I took the two images, increased the transparency of the modern Google image and superimposed them. One can begin to see how new and old align. This image also solves the problem of the mysterious group of garden houses visible on Stimson's map. Those 11 houses with gardens, were the some of the first to be built as part of London Colney's expansion eastward. 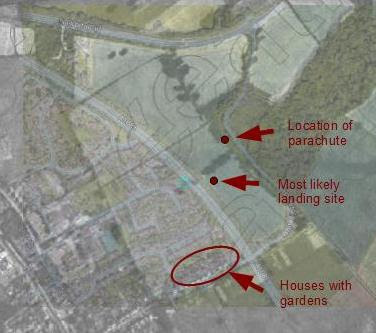 They are just to the west of the present day A1081 along White Horse Lane and are clearly visible on the war-ear aerial photograph and the modern Google Earth image. Aerial photograph showing location of houses noted on Stimson's map. Poor Stimson. A tailor by trade, he clearly was not the best at reading maps or at navigating. A good thing, in many ways, that he did not end up leading any fighting troops on the Continent. On the other hand, he did manage to outline the narrow hedge that cuts NE-SW across the fields and the isolated large trees in the middle of the field, just south of the hedge. 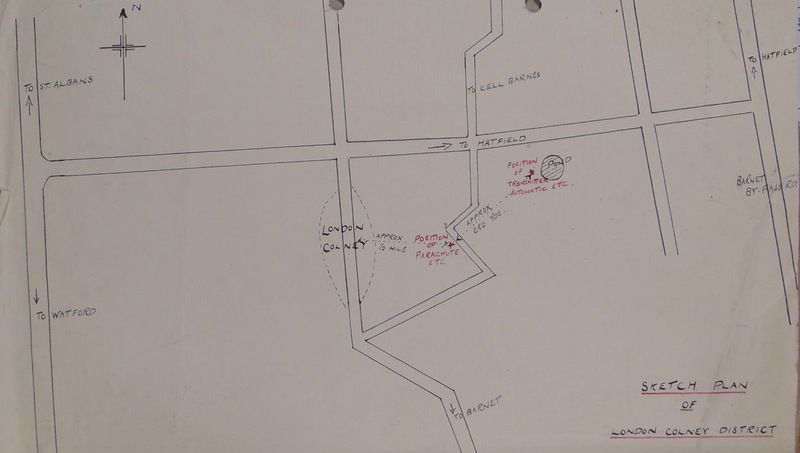 A closer view of Stimson's map shows the location of the two MI5 vehicles (circled in red below) and the group's access point to the fields (small red "x"). 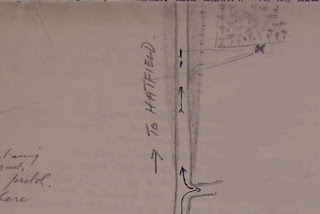 The penciled "x" just southwest of the cars marks the place where Richter hid his parachute and some other gear in a hedge. 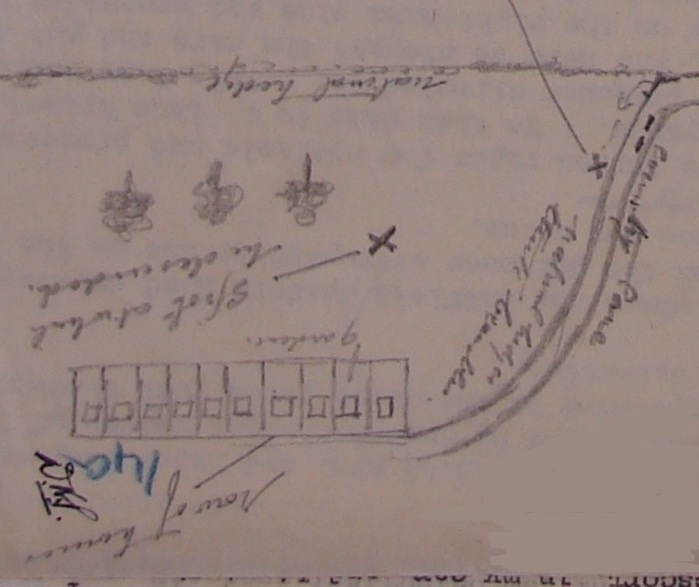 The penciled "x" near the three large trees marks Richter's landing site. 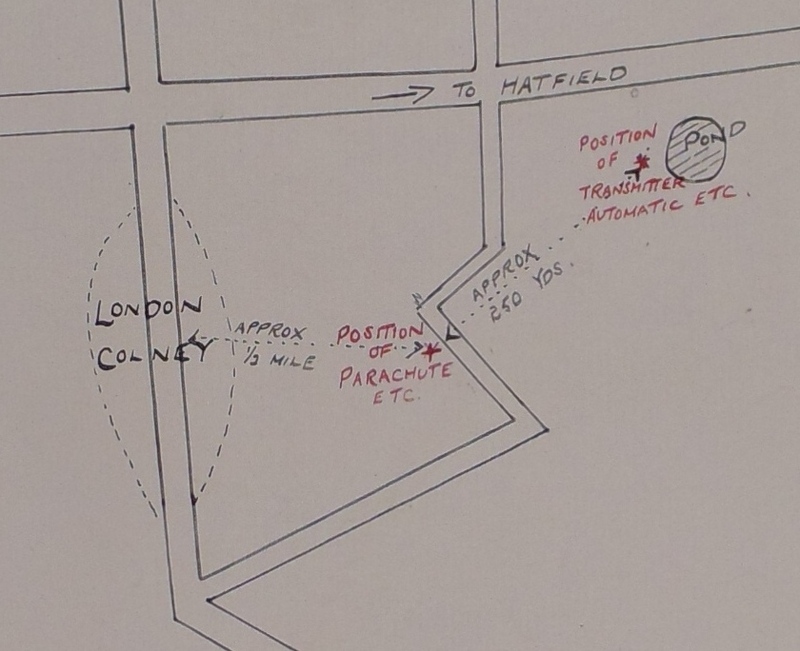 Close-up of MI5 sketch map showing Richter's landing site and equipment stash. 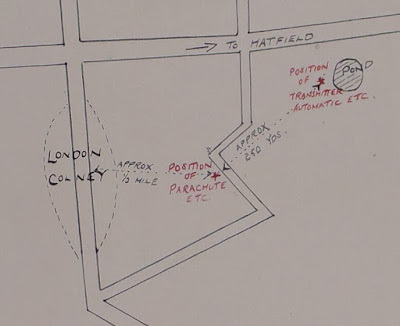 Putting all of the information together - we can come to this conclusion: Richter's parachute and some of his gear was buried within a bramble hedge along the margin of the fields adjoining White Horse Lane. 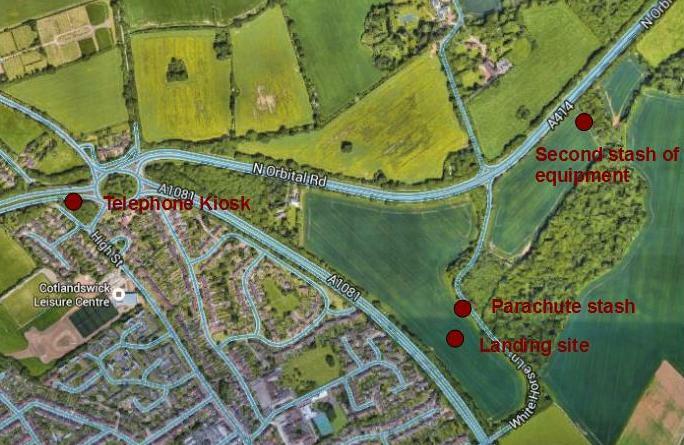 His landing site was located in the middle of the fields, apparently near the isolated trees. Superimposed images showing Richter's landing site and parachute stash. In addition to the aerial photos, one other source of information feeds into this discussion. Harold Dearden, Camp 020 psychologist, took his camera along on the trip to recover Richter's gear and his photographs have been extremely helpful. This photograph shows the group of MI5 officers in the process of retrieving the parachute and from the hedge along the margin of the fields along White Horse Lane. Richter's parachute from a hedge near White Horse Lane. Below is another photograph taken near the gate through which the group accessed the fields off of White Horse Lane. Pictured are Superintendent Reeves of the Hertford County Police and Lt. G.F. Sampson. Superintendent Reeves and Lt. George F. Sampson with Richter's parachute. If we then take a look at a modern day view at the area. The Google Street View shot below is pretty close to where the MI5 group would have accessed the fields. The parachute hiding spot would be just to the left, accessed from the fields. The large trees that used to stand in isolation in the field are long gone. accessed fields to retrieve Richter's parachute. 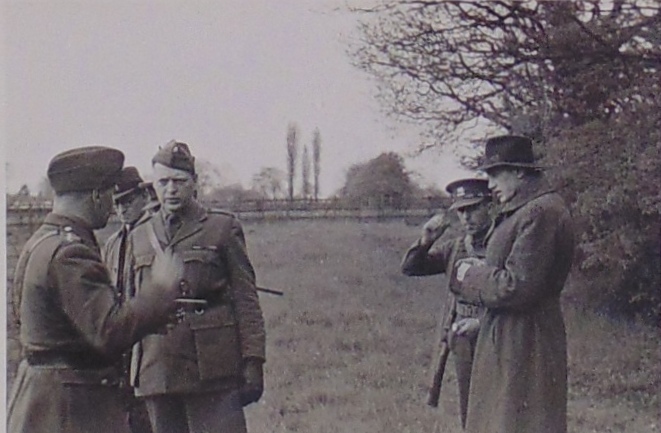 Were one to visit the site during the spring, before the trees have produced any leaves, it might be possible to match some of the larger trees along the side of the field with the other photographs taken by Dearden in 1941. While fields and bramble hedges might change, major limbs of trees might stand the test of time. As for the second site at which Richter stashed his gear. This was apparently accessed off of the main Hatfield road (now the North Orbital Road). Stimson's description notes embankments on either side of the road, and the photograph below would seem to confirm this and indicate that the group did indeed stop along a major roadway. after accessing Richter's second equipment stash. Today, the trees and shrubs have grown up, so the area looks quite different, although the embankment on the far side is still discernible. A further clue is an oblique aerial photograph taken of the area in 1950. The camera is situated over the southern part of London Colney, pointing in a rough northeasterly direction. One can see the North Orbital Road and White Horse Lane (marked in blue). 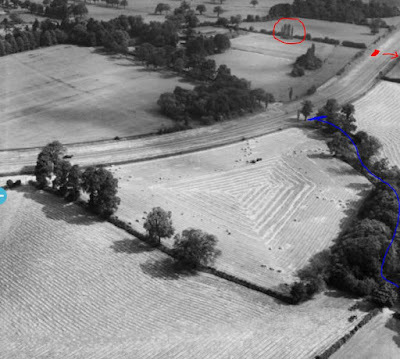 The red circle is around a clump of tall poplars, which are situated just this side of a hedge. If one looks at the Dearden photo above, one can see the poplars in the distance, as well as the end of the hedge. The red mark below on the North Orbital Road marks the position of the MI5 cars. An arrow points towards Richter's second equipment stash. London Colney area - showing White Horse Lane. In his report, Stimson noted that Richter's second stash was accessed by crossing the roadway from the parked cars, climbing a shallow embankment and then a fence. The group walked along a copse/hedge for about 30-40 yards. Today, the Google Street View below shows a similar landscape. accessed Richter's second equipment stash. 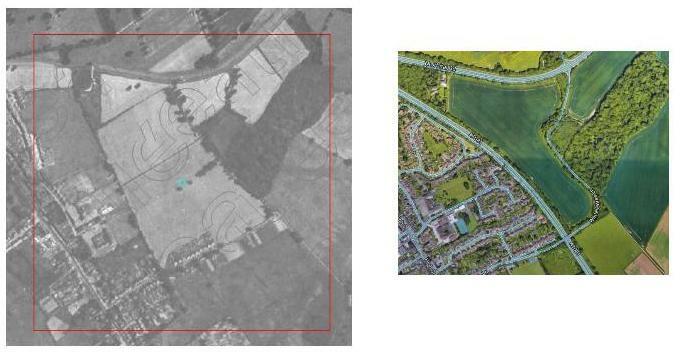 While the second location is a little harder to pinpoint, the oblique photograph was helpful. In the modern Google Earth image below, the former location of the group of poplars are marked with several small circles, and the former neighbouring hedgerow is marked by a red line. Richter's second stash, which included a couple of camera cases with radio parts, is marked with a large red circle. This also dovetails rather neatly with Stimson's sketch (once one has removed the poorly positioned "country lane" from Stimson's map). 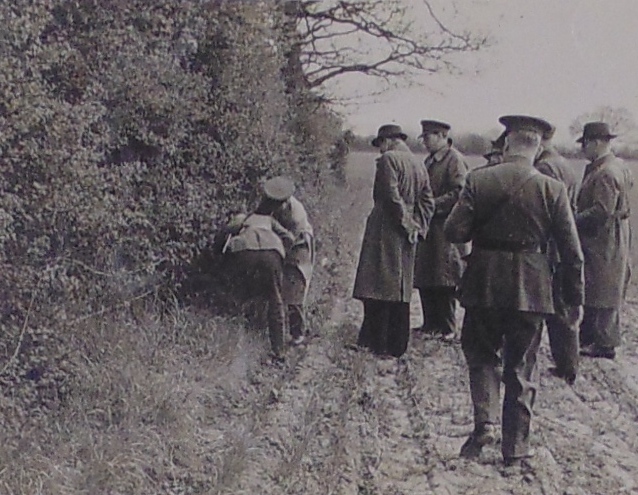 Stimson shows the embankment, fence and copse along which Richter's second equipment stash was discovered. 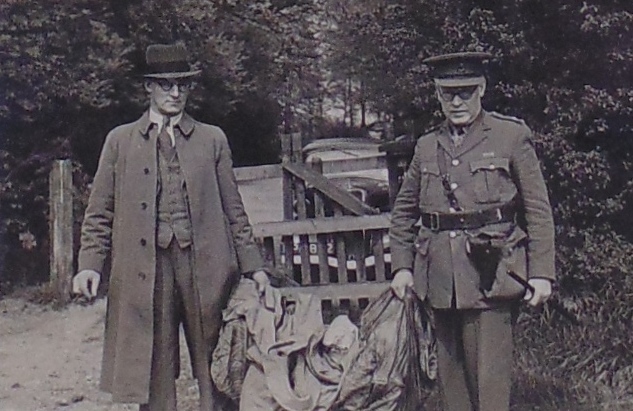 A final photograph from Harold Dearden was clearly taken at the second equipment stash. One sees the poplars and thick hedge in the distance, along with the fence below which lay the Hatfield Road. Stimson, Superintendent Reeves, Stephens, guard and Richter. After all that... here is the final conclusion in picture form. 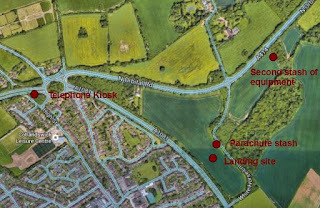 Karel Richter landed by parachute in a field to the northeast of London Colney, near White Horse Lane. He stashed his parachute and some other gear in a hedge along the field bordering White Horse Lane. He stashed the rest of his gear along a copse/hedge farther to the northeast, near the North Orbital Road. He was eventually apprehended at a telephone kiosk next to a roundabout at the north end of London Colney. 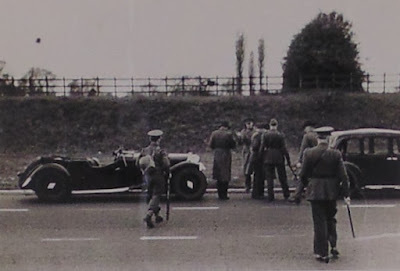 The current roundabout did not exist in 1941 and, based on the aerial photographs, the roundabout referred to in the MI5 reports was most likely the one where the High Street crossed the Hatfield Road (now the North Orbital Road). From these concrete points, it would appear that Richter, after landing in an open field, hugged the treelines as he stashed his gear and eventually found his way to the roundabout at the north end of London Colney. It is highly doubtful that he ventured as far as the Cherry Green Trees summer camp as speculated elsewhere. A link to the updated Google Map (see below) with locations can be viewed here. Me too - there isn't much in his files though.